Audi is hard at work on mobility for the future, with electrification of the powertrain playing a leading role. The new hybrid and electric vehicles form a strong cornerstone of the brand's strategy for helping shape trends in society and developments in the markets. Design study and technology demonstrator, electric car and power pack in the guise of a coupé: A versatile concept car makes its world debut in the Chinese metropolis of Shanghai as the Audi e-tron Sportback concept. The brand with the four rings presents the study of a four-door Gran Turismo with a powerful 320 kW electric drive at the Auto Shanghai 2017 this spring. The formal idiom of the coupé with Lux Silver paint finish combines classic Audi elements with an array of trendsetting details: an electrifying architecture, tailored consistently to the technology and the package of the electric drive. Aerodynamically-optimized design with a drag coefficient of 0.25, a purely electric e-tron quattro drivetrain with up to 370 kW of power output – the Audi e‑tron quattro concept is an all-electric, full-size class sport SUV. The technology study provides a firm glimpse at the production model to follow in 2018. 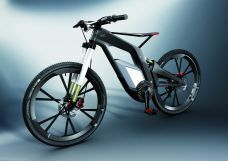 And it is a statement about the future of electric mobility: It is sporty, efficient and suitable for everyday use. The Audi A4 Avant g-tron* is the second model after the A3 Sportback g-tron* that customers can run on compressed natural gas (CNG) or Audi e-gas. Its 2.0 TFSI engines has an output of 125 kW (170 hp) and torque of 270 Nm (199.1 lb-ft). Audi is starting the 2015 season with a thoroughly revised R18 e-tron quattro. In the FIA World Endurance Championship (WEC) and in the Le Mans 24 Hours as the season’s pinnacle event, Audi is going to compete with a hybrid sports car in the 4-megajoule class. 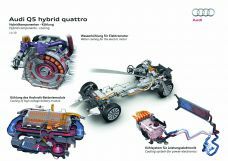 The new mild-hybrid technology (MHEV = mild hybrid electric vehicle) is standard with all A8 engines. It reduces fuel consumption by up to 0.7 liters (0.2 gal) per 100 kilometers (62.1 mi) in actual driving. The MHEV technology from Audi is based on a newly developed 48 volt main vehicle electrical system. It comprises a compact lithium-ion battery with an electrical capacity of 10 Ah, located in the luggage compartment underneath the loading floor of the A8, as well as a belt alternator starter (BSG) connected to the crankshaft. At its market introduction in Europe, the new A8 will start out with two extensively reengineered V6 turbo engines, a 3.0 TDI with 210 kW (286 hp) (Combined fuel consumption in l/100 km: 5.8 - 5.6 (40.6 - 42.0 US mpg)*; Combined CO2 emissions in g/km: 152 - 145 (244.6 - 233.4 g/mi)*) and a 3.0 TFSI with 250 kW (340 hp) (Combined fuel consumption in l/100 km: 7.8 - 7.5 (30.2 - 31.4 US mpg )*; Combined CO2 emissions in g/km: 178 - 171 (286.5 - 275.2 g/mi)*). 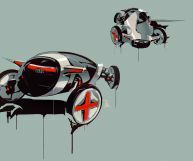 High range, swift refueling, sporty road performance: The Audi h‑tron quattro concept car can boast all these virtues. It combines a highly efficient fuel cell achieving an output of up to 110 kW with a powerful battery that can provide a temporary boost of 100 kW. The car can be fully refueled with hydrogen in around four minutes, and is then ready to drive for up to 600 kilometers (372.8 mi). The plug-in hybrid drive of the Audi prologue Avant is almost identical to the powertrain in the Audi Q7 e-tron quattro* which will be launched in summer 2015. The 3.0 TDI engine installed in the Audi prologue Avant outputs a maximum of 260 kW (353 hp), a powerful electric motor integrated in the eight-speed tiptronic contributes up to 100 kW. System output is 335 kW (455 hp), while system torque is 750 Nm (553.2 lb-ft). The eight speed tiptronic directs engine power to the quattro permanent all-wheel drive ensuring superior drive characteristics in any situation. It accelerates from a standstill to 100 km/h (62.1 mph)in six seconds, and yet consumes not even two liters of diesel per 100 kilometers (117.6 US mpg). The Audi Q7 e-tron quattro is sporty, comfortable and at the same time highly efficient. 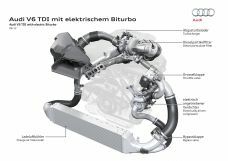 The world’s first TDI plug in hybrid with quattro drive, it is also the first plug-in hybrid with a diesel engine from Audi. The Audi R18 e-tron quattro is the most complex race car created in Ingolstadt and Neckarsulm to date. This not only applies to the mechanics. The electronics of the most recent LMP1 race car with the four rings is more sophisticated than ever before. The age of electronic data transmission from the race car on track began for Audi in 1989. At that time, an Audi 90 quattro in the IMSA GTO series radioed eight parameters to the garage where engine speeds and a few pressures and temperatures were plotted on printouts – a tiny step from today’s perspective, but one that provided important insights at the time. The Audi A8 hybrid is designed as a parallel hybrid. Its combustion engine and the electric motor are located one directly behind the other and are linked by a clutch to work together, when necessary. Their interplay – referred to as “boosting” – briefly results in a peak system output of 180 kW (245 hp) and a maximum system torque of 480 Nm (354.03 lb ft). The Q5 hybrid quattro is designed as a parallel hybrid – a convincingly efficient concept. 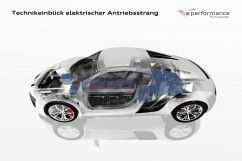 Its electric motor generates 33 kW and is located directly behind the combustion engine, a 2.0 TFSI developing 155 kW (211 hp). Both drives can be disengaged by means of a clutch according to complex control logic. They transfer their power to a heavily modified eight-speed tiptronic that does not include a torque converter. The disc-shaped electric motor occupies the space previously occupied by the torque converter. Audi can look back on over 20 years of experience in hybrid technology. 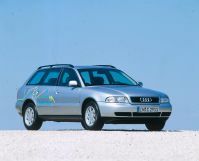 The first generation of the Audi duo had its debut as early as 1989 – a concept car based on an Audi 100 Avant. A five-cylinder gasoline engine drove the front wheels, and a part-time electric motor developing 9 kW (12 hp) drove the rear wheels. Nickel-cadmium batteries served as energy stores. Another duo variant based on an Audi 100 Avant quattro followed two years later. The 4.0 TDI has been newly developed from the ground up. It combines best-in-class performance with low consumption and guarantees maximum dynamics. The V8 engine has a displacement of 3,956 cc. The two exhaust-gas turbochargers are activated selectively according to the concept of sequential charging, since exhaust gas only flows through one turbocharger at low and intermediate load. The second turbine is only activated at higher loads. An electric powered compressor (EPC) augments the work of the two turbochargers, particularly in the lower engine speed range, providing for extremely dynamic off-the-line performance. A new solution in the competitive environment is the electromechanical active body roll stabilization. Here a compact electric motor with a three-stage planetary gearbox separates the two halves of the stabilizer. On an uneven road surface, they are actively decoupled from one another, resulting in improved ride comfort. During sporty driving, the tubes are interconnected and twisted against each other. That significantly reduces body roll, i.e. the lean of the car. Together with the transmission, the electric motors produce anything up to 1,200 Nm (885.1 lb‑ft) of torque. The effect is taut, sporty handling: The car leans less in bends and the tendency to understeer is further reduced. Electric motors offer interesting possibilities for intelligent drive management. Audi is making use of these in two fields of technology – energy recovery and quattro permanent all-wheel drive. 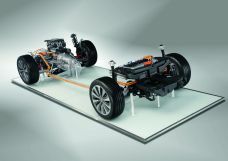 The battery in an electrified vehicle powertrain is a highly complex system. The lithium-ion technology offers opportunities and challenges in a number of areas – weight, energy, the package, safety, lifetime and, not least, cost. Electric motors are outstanding in their high reliability, low weight and high efficiency – in the range of 93 to 97 percent through a relatively broad rpm range. Unlike internal combustion engines, electric motors yield their maximum torque at extremely low rpms, practically from the starting position. For this reason, single-stage transmissions are usually all that’s needed in purely electrical vehicles. Power electronics is one of the most complex and also most costly components in the electrified powertrain: a pulse-controlled inverter that transforms the battery’s DC voltage to AC voltage as required by the electric motor. Audi pays strict attention to safety where electric mobility is concerned. The battery, the cables and all other high-voltage components are elaborately protected – in case of an accident, during operation, in assembly and during servicing. 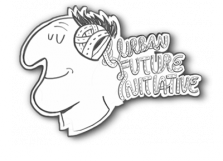 Thermal management for the future is a highly complex concept with promising new solutions. Audi has stepped up the pace of development in this area.